Isolated thunderstorms early, then partly cloudy after midnight. Low 52F. Winds WSW at 10 to 20 mph. Chance of rain 30%..
Isolated thunderstorms early, then partly cloudy after midnight. Low 52F. Winds WSW at 10 to 20 mph. Chance of rain 30%. 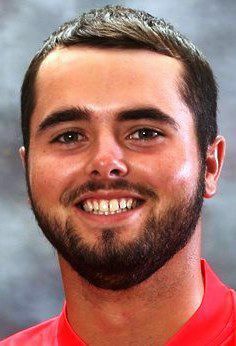 Illinois State junior David Perkins has been named the Missouri Valley Conference Golfer of the Week for his performance at the rain-shortened Mobile Bay Intercollegiate. Perkins' 2-under 142 in two rounds put him in a seven-way tie for 17th place. He helped the Redbirds tie for seventh place in a field that included nationally ranked teams such as Florida State and Louisville, which placed first and second. It was sixth MVC Golfer of the Week honor of Perkins' career. ISU returns to action Feb. 23 in the Seminole Intercollegiate at Tallahassee, Fla.
Softball picked to repeat: Illinois Wesleyan's softball team, the 2018 Division III national runner-up, has been picked to repeat as College Conference of Illinois and Wisconsin (CCIW) champions in a poll of league coaches. The Titans, ranked second in the National Fastpitch Coaches Association (NFCA) Division III Top 25, had 64 points and eight first-place votes. Carthage was second with 53 points, followed by Carroll (49), North Central (43), Millikin (35), Augustana (34), Elmhurst (20), North Park (13) and Wheaton (13). IWU fourth in baseball poll: IWU was voted fourth with 43 points in the preseason CCIW baseball coaches poll. Four-time defending champion North Central was picked first with 60 points. Carthage was second with 56, followed by Augustana (47), IWU, North Park (35), Wheaton (30), Millikin (26), Elmhurst (17) and Carroll (10). Women edge MacMurray: Pontiac High School product Ashley Harfst had 20 points and seven rebounds as Eureka College's women's basketball team slipped past MacMurray, 71-69, in a St. Louis Intercollegiate Athletic Conference game at Jacksonville. Samantha Starnes added 17 points and Kennedy Dura scored 11 for Eureka (13-11, 7-8).